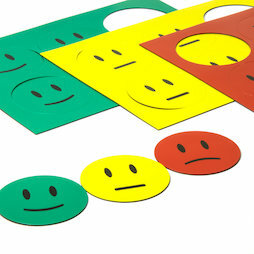 Large magnetic smiley symbols in three colours and moods. Made of colourful magnetic sheets they serve as eye-catchers or to highlight content on whiteboards, planning boards, and other magnetic surfaces. In school, such smiley symbols may be used in behaviour charts. Students can see right away if their behaviour during class is appropriate. The smilies are practical helpers in the office as well. On whiteboards and planning boards they can be used to illustrate the feasibility of projects or opinions during a brainstorming session. 1 pc. 1.00 CHF ea.